What Happened to Lake Placid's "Off Season"? The Village of Lake Placid is bustling with people again this weekend. In addition to the normal Spring paddlers and visitors, there are a number of Ironman or "multi-sport" training camps being held, plus a few graduations. We were driving home from town yesterday, very slowly following a line of cars, when the resident biologist and crowd-hater remarked, "What ever happened to the off season?" When we moved here 22 years ago, we could count on a few months of very quiet time; after ski season and before Summer, and then again in the Fall. In recent years, we have noticed Lake Placid has fewer and fewer quiet weekends, and even weekdays seem busier. It it not surprising however, when you consider all the great ink the Adirondacks are getting lately. We just made number 3 on a new list: 10 Best Places in the U. S. A. I think our uptick in visitors is a good trend, and not just for business reasons. I hope it reflects the notion that more people recognize how important it is spend time outside. I'm going with that theory; it is not like people come to the Adirondacks for the malls and shopping. One of the great things about living here is even though we may sometimes have to deal with very small 'issues' related to living in a resort town, we live here. Also, our visitors are generally very happy people because they are on vacation, spending time outside, or have an endorphin buzz going. Or all three. Alternatively, it is also very easy to find quiet and privacy. 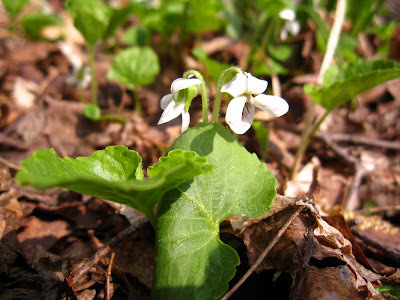 Today's featured photo is the latest bloomer, White Wood Violet, taken yesterday, someplace quiet and private.